Ryan Nicholas, 6'-7" Post, Commits to Portland!!! 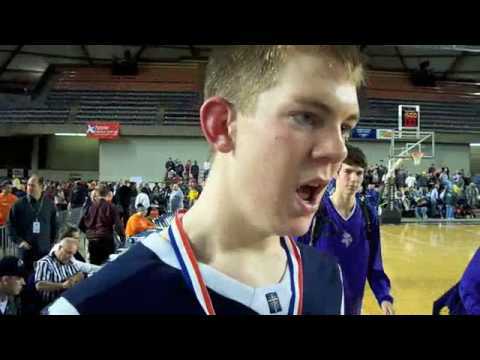 Scout.com confirms that Ryan Nicholas, a 6'7" "physical" post player from Gonzaga Prep in Spokane has committed to the Pilots. He joins Keith Shamburger for our 2010 class. I'm trying to get more info on him... I'll post when I do. From what I can tell, he was a double-double machine and will provide some toughness inside. Seems like a nice fit. Gotta credit the Zag board for tipping me off on this one. Thank you KingZag. Re: Ryan Nicholas, 6'-7" Post, Commits to Portland!!! Nice! He seems like a good fit. At the reunion I heard he is a David Pendegraph type player. He's not going to take over games but he will do the little things that every program needs to win games. purplepride13 wrote: At the reunion I heard he is a David Pendegraph type player. He's not going to take over games but he will do the little things that every program needs to win games. That sounds about right to me, though of course Pendergraph became a 1st Team All-WCC guy by his senior year. Would be awesome if Nicholas had that kind of ceiling. Still, the way I look at it... we have six scholarships open for next year (assuming we don't fill Hegarty's scholarship this summer). Not all of them can be the big-time scorer type guys. Every program needs players who do the little things... rebound, be physical, set screens, defend, etc. In my mind, Ethan, Kramer and Taishi are like that on our team currently. If the whole team was full of players like that, we'd have a hard time scoring and winning. But having a few of them to compliment the rest of the roster makes perfect sense to me. Can't wait to follow Nicholas his senior year! Was Pendergraph really a first team caliber player or was he a solid contributor on a Gonzaga team that won the conference, therefore they got 5 first teamers? Although he's a little undersized. I think he will fit nicely with the program. He has 2 out of Rev. 's 3 belief's. Toughness, and Skill. Which I think will help make up for Athletism. That's all Rev wants two out of those three at a mininumum. (Sorry spell check disapeared on me again,lol). Saw a list compiled in late may by "seatownsports.net", located in seattle listing the top fifteen high school basketball players in washingto. There are soph thru seniors on their list and theyhave ryan nicholas as nbr.12. Thats a pretty good tribute i would say. Thought I would begin closing the Ryan Nicholas chapter on Pilot Nation and at UP where it began.......although I'm sure we'll continue to follow him and write about him in the years to come. I've been watching Pilots basketball since 1962, and IME Ryan is the epitome of "Team Captain" more than any other player I've observed in all those years. It was obvious during practices and during games this year that this was Ryan's team! Not Reveno's team, but Rhino's team. Congratulations to both he and Thomas for their commitment to the classroom. Article on the UP website is a cut and paste. CLEVELAND, Ohio --- University of Portland senior forward Ryan Nicholas and junior center Thomas van der Mars were two of ten players named to the 12th Annual Division I-AAA Athletics Directors Association (DI-AAA ADA) Scholar-Athlete Men's Basketball Team, the Association announced on Monday. In addition, Nicholas was selected as this year's Postgraduate Scholarship winner and will receive $5,000 towards postgraduate studies. Portland was the only institution with two representatives on the team.Nicholas, a native of Spokane, Wash., led the West Coast Conference in rebounding (8. and double-doubles (10) and was third on the Pilots in scoring at 12.9 points per game. He shot 49 percent from the field, 39 percent from three-point range and 77 percent at the free throw line during the regular season. Nicholas finished among the Portland career leaders in a few categories. He is fifth all-time in rebounds (833) and double-doubles (24), and 12th in scoring (1,238). He was an All-WCC honorable mention selection each of the last two seasons. In the classroom, Nicholas posts a 3.52 cumulative grade-point average and will graduate in May with a degree in psychology. He was also a three-time WCC All-Academic Team member. Van der Mars had a breakout junior season and led the WCC field goal percentage (.602), was ninth in rebounding (7.2) and 16th in scoring (13.5). A native of Gouda, The Netherlands, van der Mars earned All-WCC honorable mention status this season. He ranks third all-time in field goal percentage at Portland (.569) and is also No. 7 in career blocked shots (73) and 15th in total rebounds (567). This is the latest in a long line of academic recognition for van der Mars, who became the second men's basketball player in program history to earn Capital One CoSIDA Academic All-America honors this season. Van der mars is also a two-time WCC All-Academic Team pick and he has a 3.95 grade-point average as an operations and technology management major. Basketball players from all Division I-AAA ADA member institutions are eligible for these prestigious awards. Each of the nominees was required to have a minimum grade point average of 3.20 (on a 4.00 scale) in undergraduate study and have been a starter or important reserve with legitimate athletics credentials and been a junior in academic standing at their institution. "Our Association prides itself in honoring our student-athletes for both their on-field and academic achievements each year," stated Tim Hall, chair of the Division I-AAA ADA Scholar-Athlete Team Selection Committee and athletics director at the University of Maryland Baltimore County. "We want to congratulate this year's scholar-athlete award winners, the scholar-athletes of the year and the Postgraduate Scholarship recipients for their outstanding accomplishments." A special Review Committee of Division I-AAA athletics directors were responsible for selecting the winners. Completing this task were Committee Chair Tim Hall; Don DiJulia, St. Joseph's; Gene Doris, Fairfield; Bill Hogan, Seattle; Bill Husak, Loyola Marymount; and Jean Lenti Ponsetto, DePaul. About Division I-AAA ADA: Now in its 13th year, the Division I-AAA Athletics Directors Association's mission is to enhance initiatives common to its Division I-AAA membership (the 99 Division I institutions that do not sponsor football), in particular, aspects related to their flagship basketball programs. For more information on the Division I-AAA ADA, please visit www.div1aaa-ada.com. The Division I-AAA ADA is administered by the National Association of Collegiate Directors of Athletics (NACDA), which is in its 49th year. For more information on NACDA and the 13 professional associations that fall under its umbrella, please visit www.nacda.com. Last I heard, Ryan wanted to go to law school. Hopefully he's come to his senses since then. On a more serious note, congratulations to both Ryan and Thomas. It's always great to see our athletes taking full advantage of their scholarships. DoubleDipper wrote: I've been watching Pilots basketball since 1962, and IME Ryan is the epitome of "Team Captain" more than any other player I've observed in all those years. It was obvious during practices and during games this year that this was Ryan's team! Not Reveno's team, but Rhino's team. Leadership void evident at todays workout. Being a senior does not make you a leader, leading does. Hold self and teammate to standards.